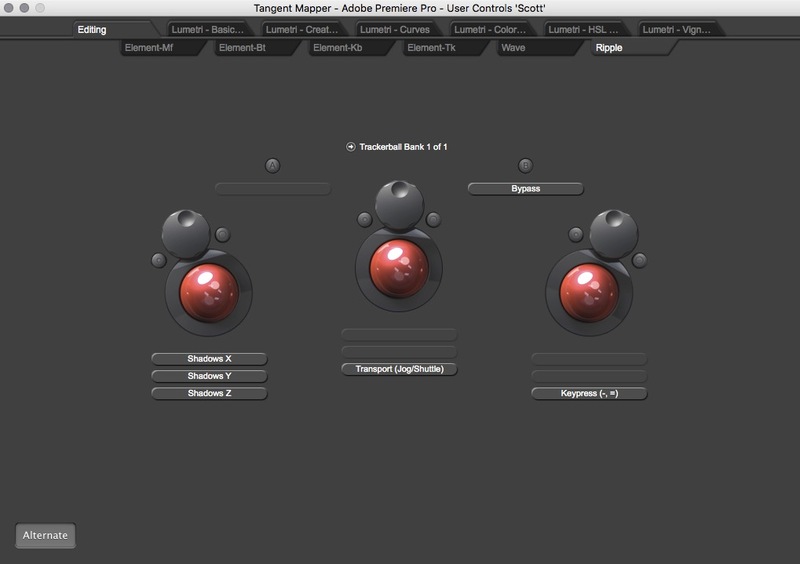 At $350 the Tangent Ripple is the cheapest way to really up your color correction game. It’s small, light and the tactile feedback a surface like this brings to the color grading process makes it one of most fun additions to your post-production arsenal. Many years ago I wrote an article called Poor man’s color control surface. 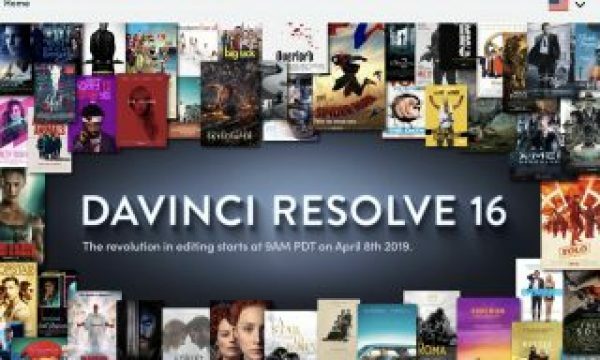 This was a time before Resolve was free, before Premiere had Lumetri, and the Color Board was just a gleam in Apple’s eye. 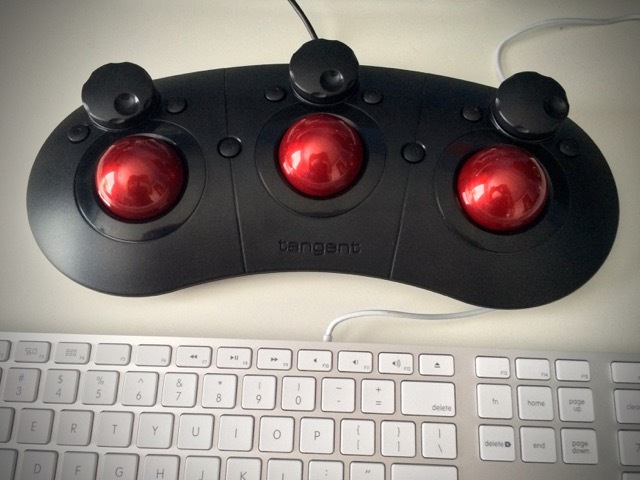 I found that it was a quite useful to take a Kensington trackball and use its ability to drag and hold to control the color wheels in Magic Bullet Colorista. It was certainly a workaround as there was no such thing as an affordable color grading surface at the time. Now we have the $350 Tangent Ripple. The Tangent Ripple fits nicely onto most any desk and integrates well into most workspaces. Ripple wasn’t always the affordable surface of the bunch. For many years the Tangent Wave has been the “affordable” color grading surface. At $1500 the Wave wasn’t that affordable for most. Tangent introduced the Element system several years ago which broke the color grading service into a modular system. We’ve reviewed both the Wave and the Element here at PVC. Altogether the Element will set you back just over $3000 but if you want only the track balls and rings, which is arguably the best part of any grading surface, that’s still around $1000. A couple of years ago the OxygenTec ProPanel came along which at around $800 was the cheapest option yet for dials and balls to use with Resolve (searching for one doesn’t reveal many product results so I don’t know if it’s still available or not). I think a lot of people used to wonder why no one could come up with a panel that hit at least the sub $500 price point. Tangent has done just that with the $350 Ripple. 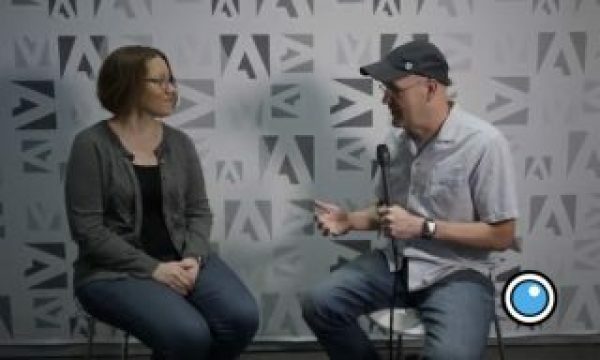 The Ripple was announced in 2015 but had it’s coming out party at NAB 2016 as Tangent, for the first time I can remember, had a booth on the show floor (we interviewed them about the Ripple). There were many Ripples there for attendees to get their hands on and it proved a popular product. 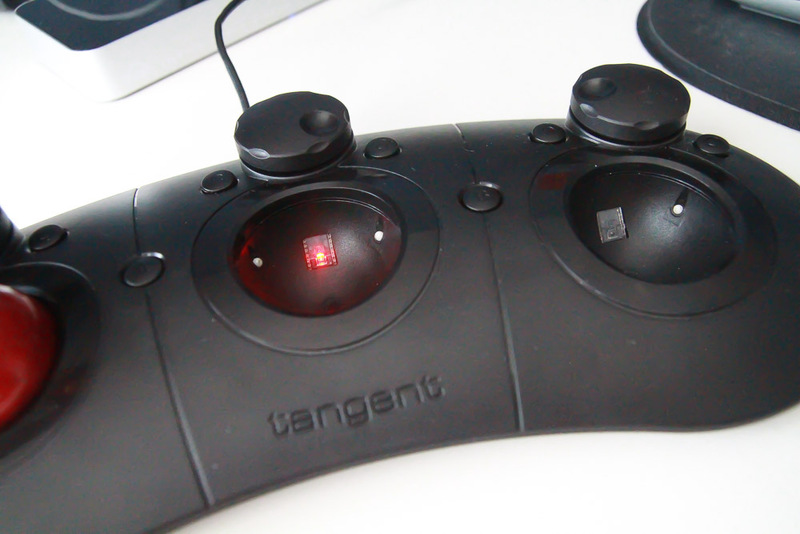 The folks at Tangent were kind enough to let me bring a demo unit home for testing and review. Who really wants to take all that product back to the UK? Construction or How Does It Feel? To get the Ripple’s price down to where it needed to be construction is plastic. The familiar Tangent red balls feel just like those on the Wave and the Element. If you’ve used the older and much larger Wave you may be surprised that the construction of the Ripple feels quite a bit better, and much “tighter” than that of the Wave. The knobs and buttons on the Wave always seemed to have a bit of play in them but that doesn’t seem to be the case with the Ripple. The buttons operate with a firm click upon push and the dials do not wobble at all left or right when you try to wobble them. No one in their right mind is going to try to wobble the dials on the Ripple but after feeling the construction of the plastic Wave I had to try. The design is slick and it’s easy to move the Ripple out of the way when not in use. Weighing in at a little over 1 pound the Ripple is light enough to carry around from system to system. The shipping version of the Ripple will come with a small, cloth draw-string bag for both the panel and the balls to help keep them safe while traveling around. It’s 13 inches long and with the trackerballs in it’s about two inches high. I brought it home from NAB in it’s shipping box as a carry-on on the plane. I’m betting that as you read this someone is designing and/or making a custom carry case for the Ripple. It also fits nicely in a backpack. The trackballs just sit in their cradles without locking so you’ll have to pull them out before transport. A USB connection and an around 5-foot cable plugs the Ripple in. That cable seemed way long as it sits right next to my USB hub but I’m sure there will be many use cases that needs the longer USB cable. Where the Wave (and the Element for that matter) has a lot of dials, buttons and screens the Ripple has virtually none of that. It’s three dials on top and the three red track balls underneath on a slightly curved surface. Reset buttons for both the dials and balls are set on either side of each of the three dials. 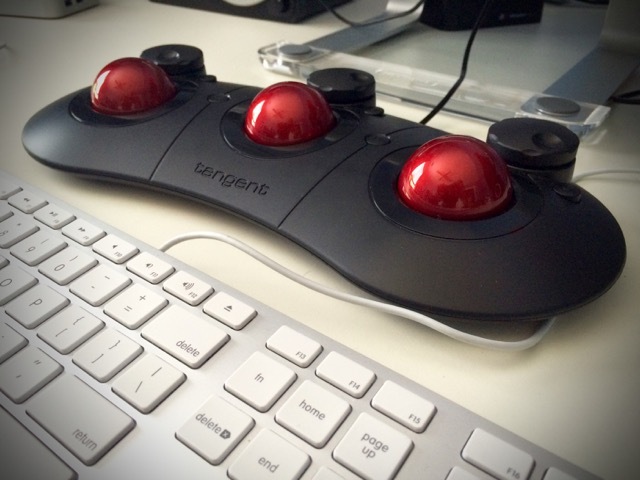 In between the trackballs are A and B buttons to give the Ripple an extra level of functionality depending on how the Tangent software is mapped, if your application allows for custom mapping. An A and B button between the trackerballs adds additional functionality. There is no power light on the Ripple, nothing to indicate it’s working or connected to your system as it sits on the desk. If you look into the trackerball cradle with the balls installed you can just make out the red optical light to know the Ripple is getting power from the USB connection. It would be nice if there was some little power light visible when looking at the Ripple. I’m sure that might have added cost but I wonder if the designers could have made use of the red optical light and included some little window in the plastic to let one of them shine through. That may have cut into Tangent’s margins more than they would have liked. Red means the Ripple is connected and getting power. 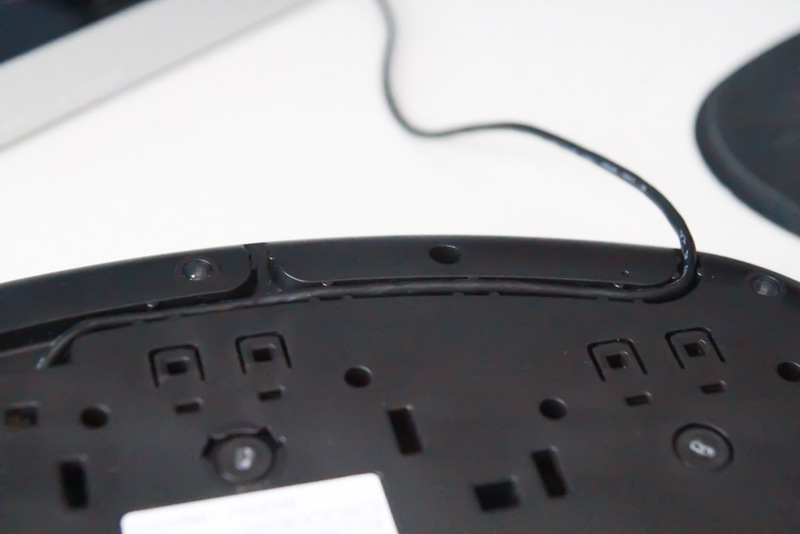 The back of the Ripple has a molded channel to route the USB cable. Take note of this and route the cable accordingly as the unit might be a little unstable as you push a button if the cable isn’t placed in this channel. At first I thought that the rubber feet weren’t aligned in the right spot for pressing the corner buttons when I started using it but then realized it was sitting partially on the USB cable as it wasn’t in the channel. I wish the cable would stay in that channel a bit better but they never do on this kind design. There’s three channels to route the USB cable from on the bottom of the Ripple. Be careful the trackerballs don’t fall out when you pick up the Ripple to route the USB cable. The familiar red trackerballs sit in their cradles with the red optical pick-up light behind. The balls don’t lock in place so be sure you remove them before turning over the Ripple. They aren’t as heavy as a billiard ball but they do have some weight. They may make your toddler cry if the ball drops on their little toe. Don’t ask me how I know. There will be those who prefer to have rings around the trackerballs (as with the Element) instead of the dials up above (as with the Wave). I’m not sure this could have been achieved and stay in the Ripple’s target price range. I heard one comment at NAB that the dials are raised too high as your fingers can hit them as you roll the balls forward. This is true but it’s not difficult to keep your fingers out of the way of the dials. I never minded the dials when using the Wave and don’t mind them on the Ripple. It’s not as pleasant as using the rings of the element-Tk but for the price I’ll take it. I doubt very few users in the Ripple’s target market will mind either. Now that we have an affordable color grading surface on the market the next step is to get hooks built in to all of our software to be able to use it. 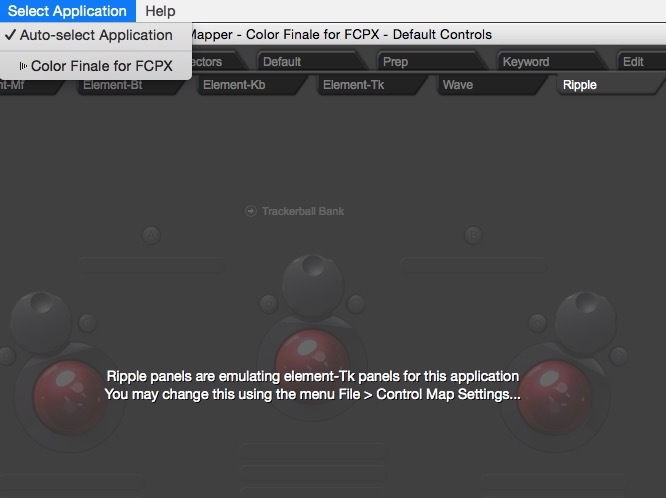 Of course DaVinci Resolve is going to support the Ripple and does so already though Resolve has a fixed mapping for control panels that can’t be changed. The Ripple isn’t listed in the Resolve preferences (yet anyway) but it really doesn’t have to be since controls are fixed. Depending on what controls you have active in the Resolve Color space the Ripple will operate them. The B button bypasses the grade. An upcoming Color Finale update for Final Cut Pro X will also support control surfaces. 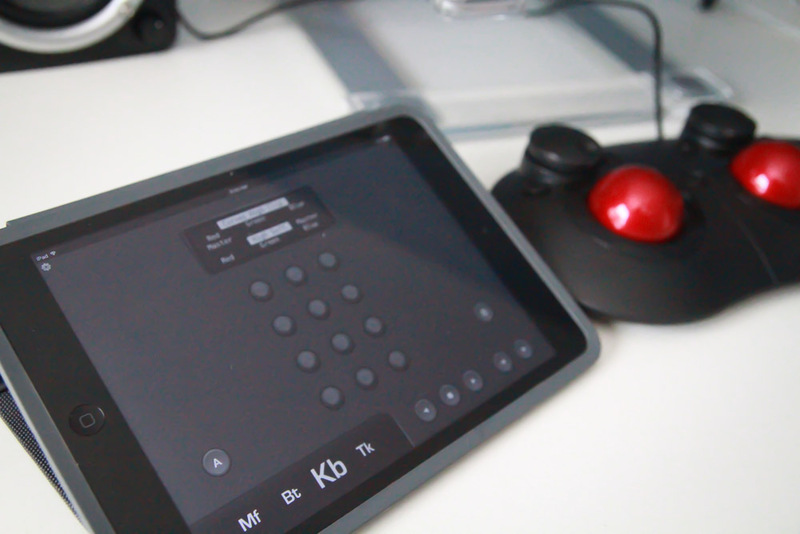 Since the Ripple isn’t far off from the element-Tk trackball panel any application that can support the TK will also support the Ripple. You can add a custom application to the Tangent Mapper and let the Ripple control other things. I did a small setup for Safari to control scrolling but it didn’t seem worth the setup time to really do much else. This thing is for color work! The key to making the Ripple work lies in the Tangent Mapper software. 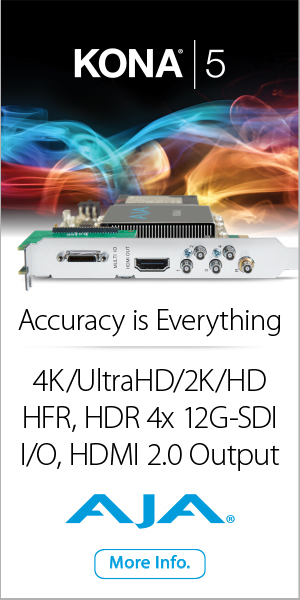 This is the interface to all Tangent hardware products. The Mapper shows a visual representation of the hardware product and, if the application allows, is where you map the controls. 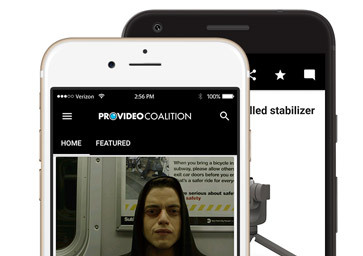 Many applications will allow for custom mappings, the notable exception being DaVinci Resolve (and Adobe Speedgrade) which has fixed mappings. 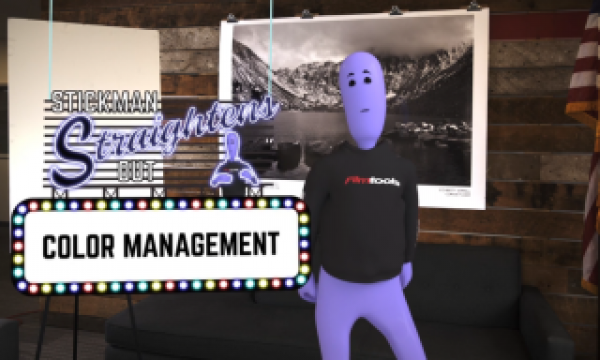 It seems a simple piece of software on the surface but sports a 50+ page manual so if you want to get the most out of any Tangent product it’s worth a read. 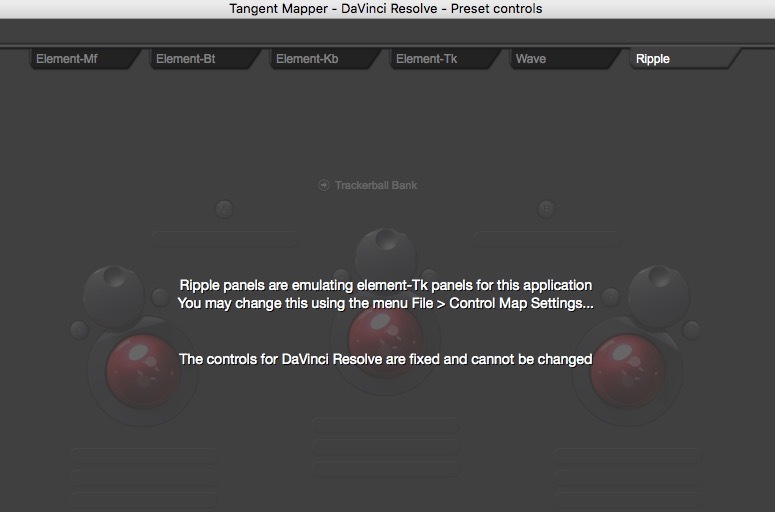 Resolve has fixed controls and they can’t be remapped via the Tangent Mapper. Why? I don’t know. 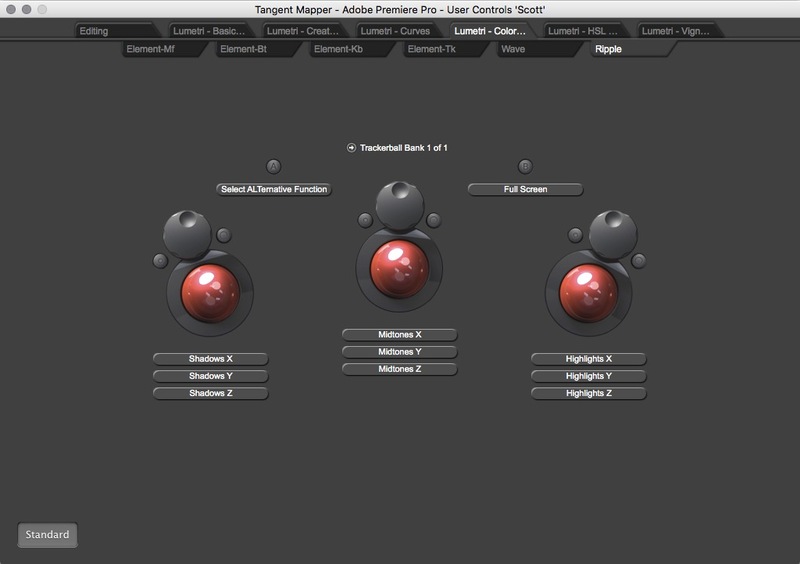 I’ve paid particular attention to the upcoming version of Premiere Pro as that is going to support Tangent control surfaces. 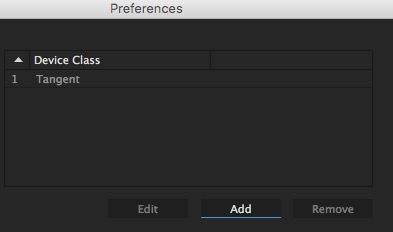 While still in beta part of the “hooks” into Premiere is the support Adobe is writing into Premiere. Control surface support in Premiere has long been mainly for audio control so it’s great to get this color hardware control coming in Premiere. The Ripple isn’t full of lots of buttons and lots of modes like the Element so expectations much be kept in check. It’s primary (and mostly only) real function is for the trackerballs and dials. But the two A and B mode buttons allow for some extension of functionality. This is the standard mapping of the Color Wheel functionality of the Lumetri Color tool in Premiere. 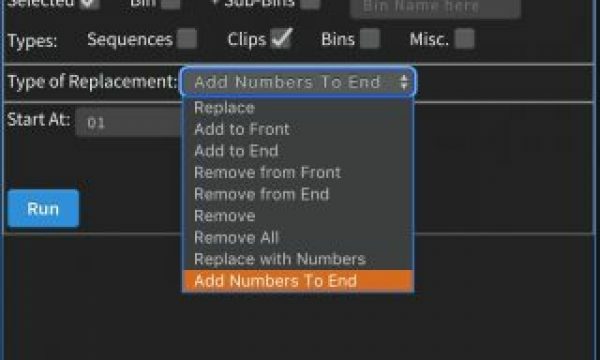 When working in Premiere this is default operation of the Ripple unless something from the beta changes. The A/B buttons can perform as just two extra buttons. The default mapping for Premiere looks to be Full Screen when hitting the B button. The A button maps to Select ALTernative Function which is an important button for the Ripple. Pressing and holding Select ALTernative Function will send all the controls into Alternate mode which is mappable with a Standard/Alternate switch in the corner of the Tangent Mapper window. The B button in alternate mode will activate the Bypass command for the PPro Lumetri grade and bypass the grade. I’ve mapped a keypress to the ALTERNATE modification dial of the right most dial to zoom in Premiere. When in the timeline it’ll zoom the timeline. Notice above the Alternate button is enabled in the Mapper to see what is mapped. The Transport mapping in the middle moves the playhead. Another example of the ALT button is that it will temporally take the trackerballs and dials into user definable coarse mode where they move much faster as you spin them. The default is fine. It’s very convenient to hold A and spin your Shadows, Midtowns and Highlights into the ballpark where you want them and then release A to fine tune them. It gives the Ripple a small level of added functionality over just balls and dials alone. 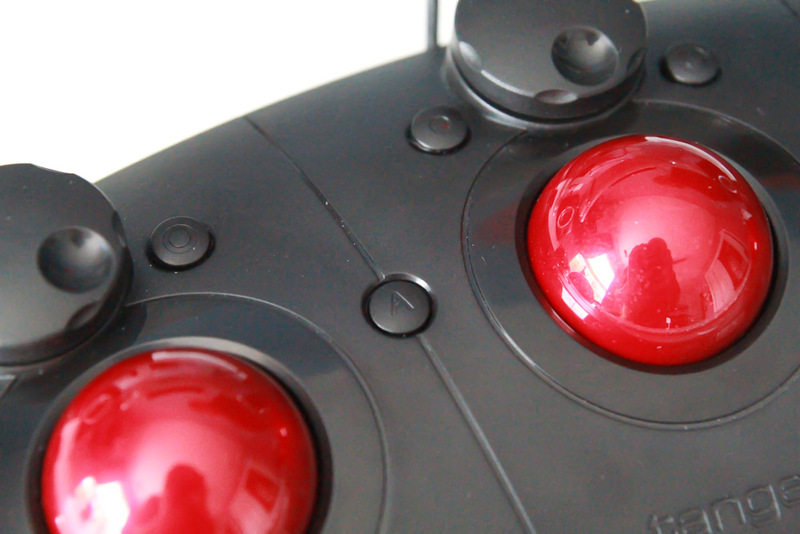 The sensitivity of the Ripple controls can be fine tuned for both Standard and Alternate mode. Could Tangent have added more buttons to the design to give a few more basic button controls? I’m sure they could and added buttons would be nice since there is so many controls in the applications but I’m guessing that most anything added beyond what we get with the Ripple would have added cost. Plus this design keeps the Ripple functionally the same as the element-Tk with the same amount of buttons and dials. All the words describing the buttons, design and construction of the Ripple are great but in the end the Ripple makes grading a much more tactile and interactive experience. It provides a level of control that a mouse alone can’t provide and for that it’s a great success. Extending the Utility of the Ripple. 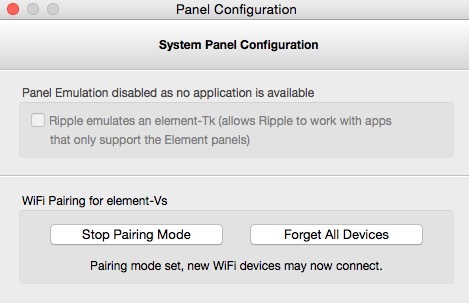 While the Ripple isn’t going to replace all the functionality of the full Tangent Element panel system you can add the element-Vs virtual surface with your touch screen device to extend the Ripple even further. There’s both an iOS version and a Google Android version but at $100 it’s not cheap. A free version includes full functionality for one hour of usage. You use the Tangent Mapper software to pair with a touchscreen device for the element-vS. The element-Vs is touch-screen versions of all four pieces of the Element hardware. They are rendered on the touch screen and is fully multi-touch enabled so you could use two trackballs at once but you probably wouldn’t do that since you’ve got the Ripple! I’ve talked about the element-Vs before (when the price was $150) and it was quite usable on its own but as a button and knob surface that can sit alongside the Ripple I think it provides some brand new usefulness without the cost of an Element set. With a touch or swipe you can move the element-Vs between the different layouts and get the benefit of their functionality. In the element-vS Mf module you can buttons and transport controls. I like having the display that tells me what each button does without having to search the menus or keyboard shortcuts. I’ve often wondered how successful the element-Vs is with its high-for-an-iOS-app price but it really can save some time during long grading sessions. This setup isn’t going to replace a full Element set if you’re a colorist but I don’t think the target market for the Ripple was ever the market for the full Element set anyway. Yes buying the element-Vs brings your total Tangent entry price to $450 ($350 for Ripple + $100 for Vs app) but considering the Wave is $1500 you’re still getting out much cheaper. 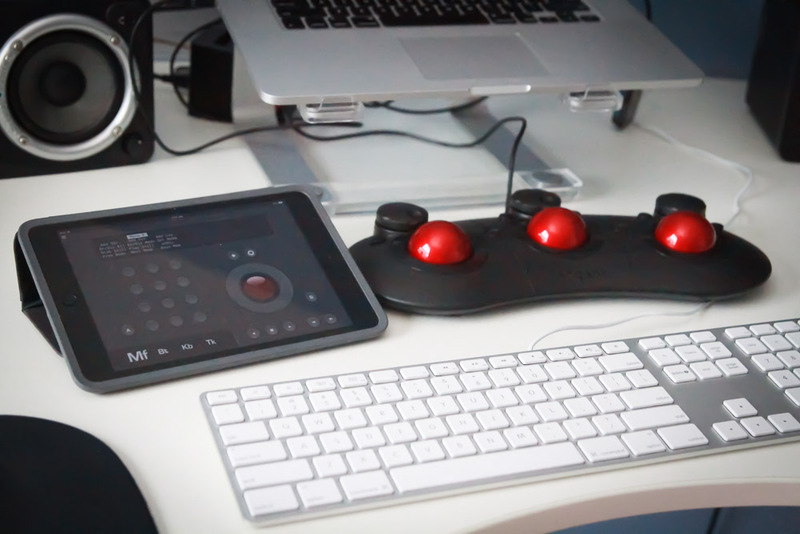 How about the virtual Element knobs sitting next to your Ripple as you’re working? If you decide you really like what you’ve got with the element-Vs but would rather have the real hardware panels you could begin to buy the Element set in pieces to more affordably step into the Element world but still use that Ripple as the ball and dial part of the set. That’d save you a little over $700 once the set is complete (the element-Tk is $1,135) though the Ripple won’t fit into the set as elegantly. I think this little surface is exactly what the market needs these days and that’s exactly what I was hoping for when I wrote my Tangent Wave review back in 2009. Wish List: How about a stripped down version for half the cost with only the trackballs, dials and a few user programable knobs and buttons?! We are living in a time when there are a lot more people doing color grading and color correction. There are way more tools for grading than ever before at a much more affordable cost. Some of our favorite tools even have powerful color tools built in. It only makes sense that someone would come along with an affordable grading surface. I’m glad that it was Tangent. They have been in the market for a long time, they have a good name and an excellent product base. They are a small company with good people creating and marketing their products. Now get out there and make their investment in bringing this new product to market worthwhile. It’ll be worth the $350 in the time you save and the enjoyment that the Ripple will bring to your color grading sessions. Affordable. And the first affordable color control surface of its kind. Lightweight with a small footprint. Easily transportable. Will make color grading work much more pleasant (and maybe fun) for the editor who’s never used one. No power, status or indicator light. Trackerballs don’t lock into place. 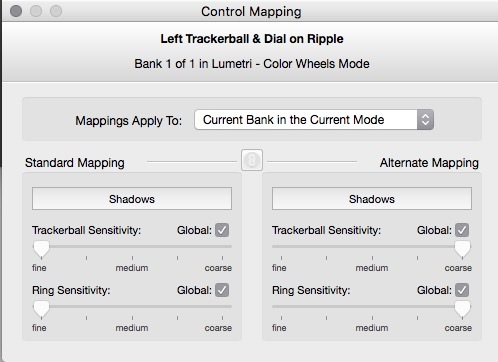 Some might prefer rings around the trackerballs instead of the separate dials. No support for Avid Media Composer / Symphony thought that’s not really Tangent’s fault. Check and route the USB cable into the channel on back so the Ripple is stable. 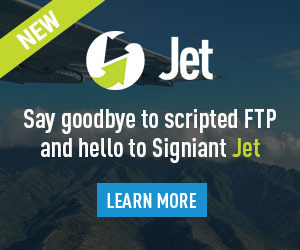 Make sure your software is the latest version with Tangent support. Remove those trackerballs before you turn over the Ripple. 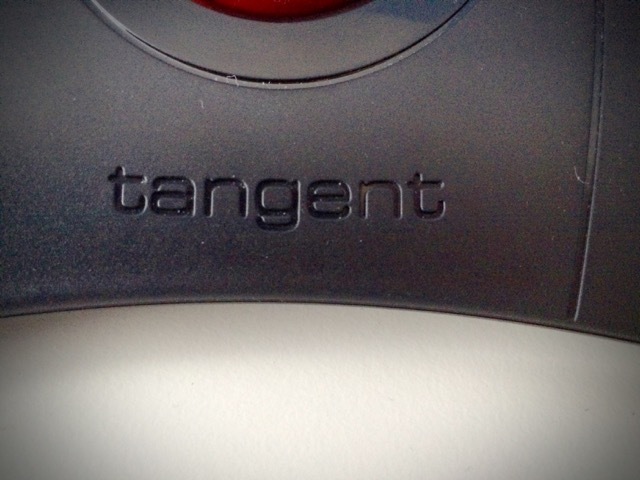 The Tangent Ripple will be available from many different resellers around the world very soon. B&H is estimating June 5. The Ripple will also be sold by Flanders Scientific when it ships (they sell all the Tangent products). UPDATE: 6/10/2016. There has been a shipping delay on some of the Tangent Ripple units due to a recall because of a “potential minor defect in the plastic.” This was noted on a post at Lift Gamma Gain and responded to by Tangent. The delay should be short and I didn’t see any defect in the unit I tested. Details are at the LGG forum link above. It’s no special club, the article isn’t live for the public yet, or is it live on the front end of the site. Seems Google is finding content that it isn’t supposed to be finding. Stay tuned as it’ll be live soon! I do only basic grading. Essentially correcting LOG footage back to “normal” so to speak. 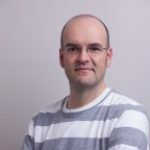 While a product that enables higher end grading to be a more hands-on tactile experience is good- it still requires knowledge and experience of grading, and the ability to do the customizations to fit a workflow of someone who knows what they want to do. It’s very nice that this gives those who are experienced and capable an easier entry to a tactile surface. Another nice thing about a surface like the Ripple is that even for those who aren’t experienced a doing color a surface like this can help you learn the craft in a much better way. The “feel” of the controls and the fact you can adjust more than one parameter at a time makes it a great learning tool. That’d be me! I’ve been tinkering with color grading for a bit, but hate using the mouse. Pre-ordered this thing when it came out, should be shipping Monday of next week… can’t wait! BTW, I saw it at Photocon LA last week at the Phase One booth, played with it for a few min, it’s NICE! Quality piece and so tiny compared to the more pro-grade panels. Got mine few min ago… it’s suuuuuweeet! My iMac took a nosedive recently… can’t wait for Apple to release the next generation so I can get back on track with cranking some projects out. Cool! Where did you order from? And how are you liking that modular pallette thingy to the left? LAB can you configure the palette gear for resolve? No the ripple the pallete gear knobs and buttons. I also just got my Ripple! Ah, my bad! 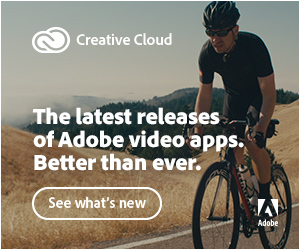 LOL, duhh… Unfortunately it’s not configured with Resolve yet – only Adobe apps and FCP X.
Hallo, the tangent can work with magic bullet?